High quality S2 chrome molybdenum steel. M-2 high speed steel for strength with black oxide coating for heat and wear resistance in wood, metal or plastic applications; split point ensures a true start and eliminates bit walking. Made of shock resistant tool steel. Fits directly into the power drill chuck or Quick-Change chuck adapter. Provides a tight fit in the fastener recess in applications such as cabinetry, decking, drywall; 1/4" hex shank. Made of shock resistant tool steel. Fits directly into the power drill chuck or Quick-Change chuck adapter. Provides a tight fit in the fastener recess in applications such as cabinetry, decking, drywall; 1/4" hex shank. M-2 high speed steel for strength with black oxide coating for heat and wear resistance in wood, metal or plastic applications; split point ensures a true start and eliminates bit walking. Advanced hardening process provides maximum durability; 1/4" hex shank. Advanced hardening process provides maximum durability; 1/4" hex shank. Advanced hardening process provides maximum durability; 1/4" hex shank. Titanium Nitride coating reduces friction and last longer, cutting edge stays sharper longer. Used in repetitive metal drilling with portable drills or stationary drill press. Jobber length. Milled, one piece made of shock resistant tool steel. Titanium Nitride coating reduces friction and last longer, cutting edge stays sharper longer. Used in repetitive metal drilling with portable drills or stationary drill press. Jobber length. M-2 high speed steel for strength with black oxide coating for heat and wear resistance in wood, metal or plastic applications; split point ensures a true start and eliminates bit walking. Titanium Nitride coating reduces friction and last longer, cutting edge stays sharper longer. Used in repetitive metal drilling with portable drills or stationary drill press. Jobber length. Made of shock resistant tool steel for maximum durability. Advanced hardened core, heat treated for extra strength reduces stripping and breakage; 1/4" hex shank. Square recess impact insert bits. For driving and removing fasteners. Engineered for maximum durability and long life with impact drivers. Forged so they fit more precisely, which reduces stripping and increases the life of the bit. Heavy-duty, cold-forged, high grade steel to withstand extreme high torque output. Black oxide finish resists corrosion. Impact ready bit with magnetic screw lock system. Made of shock resistant tool steel. Fits directly into the power drill chuck or Quick-Change chuck adapter. Provides a tight fit in the fastener recess in applications such as cabinetry, decking, drywall; 1/4" hex shank. Titanium Nitride coating reduces friction and last longer, cutting edge stays sharper longer. Split point eliminates the need for a center punch and keeps the drill from skating. All sizes 3/16" and larger have three flats on the shank for a better grip on chuck. Made of shock resistant tool steel for maximum durability. Advanced hardened core, heat treated for extra strength reduces stripping and breakage; 1/4" hex shank. 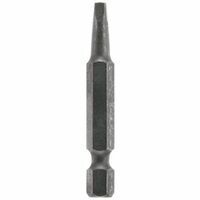 Bosch Power Screwdriver Bit, NO 2 Point, Square Recess, R2 Point, 2 in Overall Length, Hexagonal Shank, 1/4 in Shank, Steel, Black Oxide, Impact Tough Hardness, For Impact Driver High quality S2 chrome molybdenum steel. High quality S2 chrome molybdenum steel. High quality S2 chrome molybdenum steel. Titanium Nitride coating reduces friction and last longer, cutting edge stays sharper longer. Used in repetitive metal drilling with portable drills or stationary drill press. Jobber length. Titanium Nitride coating reduces friction and last longer, cutting edge stays sharper longer. Split point eliminates the need for a center punch and keeps the drill from skating. All sizes 3/16" and larger have three flats on the shank for a better grip on chuck. High quality S2 chrome molybdenum steel. Geometric design provides the shock absorption zone. Proprietary steel and heat treat process for maximum strength and durability. Forged tips for maximum grip. Geometric design provides the shock absorption zone. Proprietary steel and heat treat process for maximum strength and durability. Forged tips for maximum grip. Geometric design provides the shock absorption zone. Proprietary steel and heat treat process for maximum strength and durability. Forged tips for maximum grip. Made of shock resistant tool steel. Fits directly into the power drill chuck or Quick-Change chuck adapter. Provides a tight fit in the fastener recess in applications such as cabinetry, decking, drywall; 1/4" hex shank. Titanium Nitride coating reduces friction and last longer, cutting edge stays sharper longer. Split point eliminates the need for a center punch and keeps the drill from skating. All sizes 3/16" and larger have three flats on the shank for a better grip on chuck. Impact power bit. Square recess bit is built for maximum durability and long life with impact drivers. Forged bit for ideal fit, which reduces stripping. Cold forged, high grade steel to withstand high torque output. Black oxide finish resists corrosion. Titanium Nitride coating reduces friction and last longer, cutting edge stays sharper longer. Split point eliminates the need for a center punch and keeps the drill from skating. All sizes 3/16" and larger have three flats on the shank for a better grip on chuck. Titanium Nitride coating reduces friction and last longer, cutting edge stays sharper longer. Used in repetitive metal drilling with portable drills or stationary drill press. Jobber length. Titanium Nitride coating reduces friction and last longer, cutting edge stays sharper longer. Split point eliminates the need for a center punch and keeps the drill from skating. All sizes 3/16" and larger have three flats on the shank for a better grip on chuck. Made of shock resistant tool steel for maximum durability. Advanced hardened core, heat treated for extra strength reduces stripping and breakage; 1/4" hex shank. Made of shock resistant tool steel for maximum durability. Advanced hardened core, heat treated for extra strength reduces stripping and breakage; 1/4" hex shank. Titanium Nitride coating reduces friction and last longer, cutting edge stays sharper longer. Used in repetitive metal drilling with portable drills or stationary drill press. Jobber length. M-2 high speed steel for strength with black oxide coating for heat and wear resistance in wood, metal or plastic applications; split point ensures a true start and eliminates bit walking. Titanium Nitride coating reduces friction and last longer, cutting edge stays sharper longer. Split point eliminates the need for a center punch and keeps the drill from skating. All sizes 3/16" and larger have three flats on the shank for a better grip on chuck. M-2 high speed steel for strength with black oxide coating for heat and wear resistance in wood, metal or plastic applications; split point ensures a true start and eliminates bit walking. Impact ready bit with magnetic screw lock system. 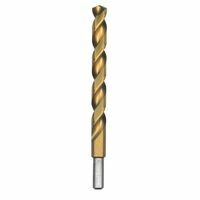 Bosch Jobber Drill Bit, 1/16 in Diameter, 1-7/8 in Overall Length, 2 Flutes, Twist Flute, 1/16 in Shank, Straight Shank, 118 deg Point, Split Point, Titanium Coated, Applicable Materials: Sheet Metal Ducts, Steel, Copper, Brass, Aluminum, Plastic, Plexiglas, Wood, Veneers, Vinyl Siding, Plasterboard, PVC, Stainless Steel and Cast Iron Impact power bit. Square recess bit is built for maximum durability and long life with impact drivers. Forged bit for ideal fit, which reduces stripping. Cold forged, high grade steel to withstand high torque output. Black oxide finish resists corrosion. Impact power bit. Square recess bit is built for maximum durability and long life with impact drivers. Forged bit for ideal fit, which reduces stripping. Cold forged, high grade steel to withstand high torque output. Black oxide finish resists corrosion. Geometric design provides the shock absorption zone. Proprietary steel and heat treat process for maximum strength and durability. Forged tips for maximum grip. Geometric design provides the shock absorption zone. Proprietary steel and heat treat process for maximum strength and durability. Forged tips for maximum grip. M7 grade steel with extra hard titanium coating and parabolic bit flutes for strength and maximum service in applications such as metal, wood and plastic; split point prevents walking. Titanium Nitride coating reduces friction and last longer, cutting edge stays sharper longer. Used in repetitive metal drilling with portable drills or stationary drill press. Jobber length. M7 grade steel with extra hard titanium coating and parabolic bit flutes for strength and maximum service in applications such as metal, wood and plastic; split point prevents walking. Made of shock resistant tool steel for maximum durability. Advanced hardened core, heat treated for extra strength reduces stripping and breakage; 1/4" hex shank. M-2 high speed steel for strength with black oxide coating for heat and wear resistance in wood, metal or plastic applications; split point ensures a true start and eliminates bit walking. M7 grade steel with extra hard titanium coating and parabolic bit flutes for strength and maximum service in applications such as metal, wood and plastic; split point prevents walking. Impact ready bits with FlexTorq have increased durability for long life. CNC machined resulting in accurate manufacturing for optimal fit into screw recess. Reflex core allows bits to flex up to 15 degrees to reduce breakage. Magnetic screw lock system for fastener retention to minimize drops and reduce wobbles. Can withstand up to 2000 in/lb (inch/pound) of torque, the perfect bit for high torque applications. Shank Length: 2". Size: No. 1. Geometric design provides the shock absorption zone. Proprietary steel and heat treat process for maximum strength and durability. Forged tips for maximum grip. 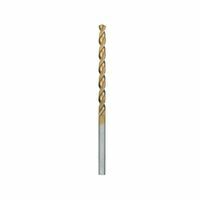 Bosch Jobber Length Drill Bit, 9/64 in Diameter, 2-3/4 in Overall Length, 2-7/8 in Cutting Depth, Twist Flute, 9/64 in Shank, Flat, Straight Shank, 135 deg Point, Split Point, Titanium Coated, CSA Certified, OSHA Approved, cUL, UL Listed, For General Purpose Drilling Applications M-2 high speed steel for strength with black oxide coating for heat and wear resistance in wood, metal or plastic applications; split point ensures a true start and eliminates bit walking. Bit is constructed of high speed steel for the best combination of strength, heat resistance, and wear resistance; 135-degree split point reduces feed pressure and allows for easier penetration without work hardening. Can be used with screw extractors. Carded. Impact power bit. Square recess bit is built for maximum durability and long life with impact drivers. Forged bit for ideal fit, which reduces stripping. Cold forged, high grade steel to withstand high torque output. Black oxide finish resists corrosion. M7 grade steel with extra hard titanium coating and parabolic bit flutes for strength and maximum service in applications such as metal, wood and plastic; split point prevents walking. M7 grade steel with extra hard titanium coating and parabolic bit flutes for strength and maximum service in applications such as metal, wood and plastic; split point prevents walking. CNC-machined bit tip for precise fit in screw heads for reducing cam-out. Magnetic Screw Lock sleeve minimizes drops and reduces wobbles. Extended FlexTorq zone transfers optimal torque for durability and a longer life. For use in bit tip holders driving screws in a variety of materials. Made of shock resistant tool steel. Fits directly into the power drill chuck or Quick-Change chuck adapter. Provides a tight fit in the fastener recess in applications such as cabinetry, decking, drywall; 1/4" hex shank. Made of shock resistant tool steel. Fits directly into the power drill chuck or Quick-Change chuck adapter. Provides a tight fit in the fastener recess in applications such as cabinetry, decking, drywall; 1/4" hex shank. Titanium Nitride coating reduces friction and last longer, cutting edge stays sharper longer. Split point eliminates the need for a center punch and keeps the drill from skating. All sizes 3/16" and larger have three flats on the shank for a better grip on chuck. M-2 high speed steel for strength with black oxide coating for heat and wear resistance in wood, metal or plastic applications; split point ensures a true start and eliminates bit walking. M-2 high speed steel for strength with black oxide coating for heat and wear resistance in wood, metal or plastic applications; split point ensures a true start and eliminates bit walking. Titanium Nitride coating reduces friction and last longer, cutting edge stays sharper longer. Split point eliminates the need for a center punch and keeps the drill from skating. All sizes 3/16" and larger have three flats on the shank for a better grip on chuck. Features a split point that starts on contact with no walking or skating, eliminating the need for a center punch. Bosch black oxide bits offer durability, speed and selection to support most general purpose applications. Speed helix design for faster drilling. Easier drilling and reduced heat for extended drill bit life. For use in steel, copper, aluminum, brass, oak, maple, MDG, pine, PVC, polycarbonate, acrylic, ABS, nylon and composite materials. Shockwave impact duty drill bits are engineered for extreme durability and long life. Made from proprietary steel and heat treated to control hardness. Forged tip allows for a secure grip and maximum contact, eliminating stripping or slipping. Ideal for heavy duty impact applications for all drilling and fastening needs. Includes: Square Recess Shockwave 6'' power bit. Bit is constructed of high speed steel for the best combination of strength, heat resistance, and wear resistance; 135-degree split point reduces feed pressure and allows for easier penetration without work hardening. Can be used with screw extractors. Carded. Titanium Nitride coating reduces friction and last longer, cutting edge stays sharper longer. Used in repetitive metal drilling with portable drills or stationary drill press. Jobber length. M-2 high speed steel for strength with black oxide coating for heat and wear resistance in wood, metal or plastic applications; split point ensures a true start and eliminates bit walking. Titanium Nitride coating reduces friction and last longer, cutting edge stays sharper longer. Used in repetitive metal drilling with portable drills or stationary drill press. Jobber length. Black oxide coated for greater wear resistance; split point drills on contact and prevents walking. Parabolic flute design improves chip ejection in metal and wood drilling applications. Helix is 31 degrees which minimizes the over aggressiveness of a true parabolic flute. 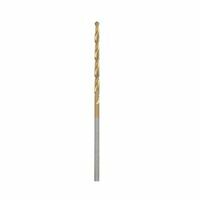 Bosch Jobber Length Drill Bit, 1/4 in Diameter, 4 in Overall Length, Twist Flute, 1/4 in Shank, Flat, Straight Shank, 135 deg Point, Split Point, Titanium Coated, Applicable Materials: Sheet Metal Ducts, Steel, Copper, Brass, Aluminum, Plastic, Plexiglas, Wood, Veneers, Vinyl Siding, Plasterboard, PVC, Stainless Steel and Cast Iron For heavy-duty impact, drilling and fastening use. Geometric design provides shock absorption zone. Heat treated for maximum strength. Forged tip allows for maximum grip and helps eliminate stripping or slipping. M-2 high speed steel for strength with black oxide coating for heat and wear resistance in wood, metal or plastic applications; split point ensures a true start and eliminates bit walking. Geometric design provides the shock absorption zone. Proprietary steel and heat treat process for maximum strength and durability. Forged tips for maximum grip. Titanium Nitride coating reduces friction and last longer, cutting edge stays sharper longer. Split point eliminates the need for a center punch and keeps the drill from skating. All sizes 3/16" and larger have three flats on the shank for a better grip on chuck. Features a split point that starts on contact with no walking or skating, eliminating the need for a center punch. Bosch black oxide bits offer durability, speed and selection to support most general purpose applications. Speed helix design for faster drilling. Easier drilling and reduced heat for extended drill bit life. For use in steel, copper, aluminum, brass, oak, maple, MDG, pine, PVC, polycarbonate, acrylic, ABS, nylon and composite materials. Bit is constructed of high speed steel for the best combination of strength, heat resistance, and wear resistance; 135-degree split point reduces feed pressure and allows for easier penetration without work hardening. Can be used with screw extractors. Carded. M-2 high speed steel for strength with black oxide coating for heat and wear resistance in wood, metal or plastic applications; split point ensures a true start and eliminates bit walking. Titanium Nitride coating reduces friction and last longer, cutting edge stays sharper longer. Split point eliminates the need for a center punch and keeps the drill from skating. All sizes 3/16" and larger have three flats on the shank for a better grip on chuck. Milled, one piece made of shock resistant tool steel. M7 grade steel with extra hard titanium coating and parabolic bit flutes for strength and maximum service in applications such as metal, wood and plastic; split point prevents walking. M-2 high speed steel for strength with black oxide coating for heat and wear resistance in wood, metal or plastic applications; split point ensures a true start and eliminates bit walking. M-2 high speed steel for strength with black oxide coating for heat and wear resistance in wood, metal or plastic applications; split point ensures a true start and eliminates bit walking. Black oxide coated for greater wear resistance; split point drills on contact and prevents walking. Parabolic flute design improves chip ejection in metal and wood drilling applications. Helix is 31 degrees which minimizes the over aggressiveness of a true parabolic flute. Titanium Nitride coating reduces friction and last longer, cutting edge stays sharper longer. Split point eliminates the need for a center punch and keeps the drill from skating. All sizes 3/16" and larger have three flats on the shank for a better grip on chuck. Titanium Nitride coating reduces friction and last longer, cutting edge stays sharper longer. Split point eliminates the need for a center punch and keeps the drill from skating. All sizes 3/16" and larger have three flats on the shank for a better grip on chuck. Features a split point that starts on contact with no walking or skating, eliminating the need for a center punch. Bosch black oxide bits offer durability, speed and selection to support most general purpose applications. Speed helix design for faster drilling. Easier drilling and reduced heat for extended drill bit life. For use in steel, copper, aluminum, brass, oak, maple, MDG, pine, PVC, polycarbonate, acrylic, ABS, nylon and composite materials. Titanium Nitride coating reduces friction and last longer, cutting edge stays sharper longer. Used in repetitive metal drilling with portable drills or stationary drill press. Jobber length. Milled, one piece made of shock resistant tool steel. M-2 high speed steel for strength with black oxide coating for heat and wear resistance in wood, metal or plastic applications; split point ensures a true start and eliminates bit walking. Milled, one piece made of shock resistant tool steel. Advanced hardening process provides maximum durability; 1/4" hex shank. Titanium Nitride coating reduces friction and last longer, cutting edge stays sharper longer. Used in repetitive metal drilling with portable drills or stationary drill press. Jobber length. Black oxide coated for greater wear resistance; split point drills on contact and prevents walking. Parabolic flute design improves chip ejection in metal and wood drilling applications. Helix is 31 degrees which minimizes the over aggressiveness of a true parabolic flute. Made of shock resistant tool steel. Fits directly into the power drill chuck or Quick-Change chuck adapter. Provides a tight fit in the fastener recess in applications such as cabinetry, decking, drywall; 1/4" hex shank. Genuine Senco Replacement Part. Made with steel to hold up in demanding applications. Measures approximately 6-7/8" long. Compatible with models: DS212-18V, DS215-18V, DS232-AC and DS235-AC. Titanium Nitride coating reduces friction and last longer, cutting edge stays sharper longer. Split point eliminates the need for a center punch and keeps the drill from skating. All sizes 3/16" and larger have three flats on the shank for a better grip on chuck. Features a split point that starts on contact with no walking or skating, eliminating the need for a center punch. Bosch black oxide bits offer durability, speed and selection to support most general purpose applications. Speed helix design for faster drilling. Easier drilling and reduced heat for extended drill bit life. For use in steel, copper, aluminum, brass, oak, maple, MDG, pine, PVC, polycarbonate, acrylic, ABS, nylon and composite materials. Stays sharper longer. Variable Helix flute geometry for faster material removal. Chip breaker decreases heat buildup. Set includes: (1) 1/8" (3.2mm) with Chip Breaker, (1) 5/32" (4.0 mm) with Chip Breaker, (1) 3/16" (4.8 mm) with Chip Breaker and (1) 1/4" (6.4 mm) with Chip Breaker. 2 drive bits per pack for use with Duraspin technology integrated auto-feed screw systems. Compatible with Duraspin models: Fits: DS312-18V and DS332-AC. Fits: DS320 Dewalt Insert Bit, Series: DW2202B10, NO 2 Point, Square Recess Point, Tool Steel Bit is constructed of high speed steel for the best combination of strength, heat resistance, and wear resistance; 135-degree split point reduces feed pressure and allows for easier penetration without work hardening. Can be used with screw extractors. Carded. M7 grade steel with extra hard titanium coating and parabolic bit flutes for strength and maximum service in applications such as metal, wood and plastic; split point prevents walking. Titanium Nitride coating reduces friction and last longer, cutting edge stays sharper longer. Used in repetitive metal drilling with portable drills or stationary drill press. Jobber length. High speed steel with M-35, five percent cobalt, for higher heat and abrasion resistance; heavy-duty web construction for strength and durability. Split point begins drilling immediately, minimizing bit walk when used in applications such as metal drilling, including heavy-duty abrasive alloy metal drilling on hardened steel (heat-treated). High speed steel with M-35, five percent cobalt, for higher heat and abrasion resistance; heavy-duty web construction for strength and durability. Split point begins drilling immediately, minimizing bit walk when used in applications such as metal drilling, including heavy-duty abrasive alloy metal drilling on hardened steel (heat-treated). High speed steel with M-35, five percent cobalt, for higher heat and abrasion resistance; heavy-duty web construction for strength and durability. Split point begins drilling immediately, minimizing bit walk when used in applications such as metal drilling, including heavy-duty abrasive alloy metal drilling on hardened steel (heat-treated). Titanium Nitride coating reduces friction and last longer, cutting edge stays sharper longer. Used in repetitive metal drilling with portable drills or stationary drill press. Jobber length. Universal quick change adapter; when inserted into the chuck of a power drill it allows for the quick change of all bits that have a 1/4" quick change shank. Bosch Jobber Length Drill Bit, 3/8 in Diameter, 5 in Overall Length, 5 in Cutting Depth, Twist Flute, 3/8 in Shank, Flat, Straight Shank, 135 deg Point, Split Point, Titanium Coated, CSA Certified, OSHA Approved, cUL, UL Listed, For General Purpose Drilling Applications Black oxide coated for greater wear resistance; split point drills on contact and prevents walking. Parabolic flute design improves chip ejection in metal and wood drilling applications. Helix is 31 degrees which minimizes the over aggressiveness of a true parabolic flute. Features a split point that starts on contact with no walking or skating, eliminating the need for a center punch. Bosch black oxide bits offer durability, speed and selection to support most general purpose applications. Speed helix design for faster drilling. Easier drilling and reduced heat for extended drill bit life. For use in steel, copper, aluminum, brass, oak, maple, MDG, pine, PVC, polycarbonate, acrylic, ABS, nylon and composite materials. High speed steel with M-35, five percent cobalt, for higher heat and abrasion resistance; heavy-duty web construction for strength and durability. Split point begins drilling immediately, minimizing bit walk when used in applications such as metal drilling, including heavy-duty abrasive alloy metal drilling on hardened steel (heat-treated). M-2 high speed steel for strength with black oxide coating for heat and wear resistance in wood, metal or plastic applications; split point ensures a true start and eliminates bit walking. Long-lasting container made from shatter-resistant materials. Flip top opens easily with one-hand ergonomic design; 1/4" hex shank Black Oxide coating provides longer life. Split point tips to prevent walking and universal 1/4" hex shank locking system prevents slipping. Includes: 1/16", 3/32", 1/8", 5/32", 3/16", and 1/4". Titanium Nitride coating reduces friction and last longer, cutting edge stays sharper longer. Used in repetitive metal drilling with portable drills or stationary drill press. Jobber length. Impact power bit. Square recess bit is built for maximum durability and long life with impact drivers. Forged bit for ideal fit, which reduces stripping. Cold forged, high grade steel to withstand high torque output. Black oxide finish resists corrosion. High quality steel with black oxide finish for corrosion resistance in applications such as automotive, MRO, portable drills, stationary drill press; 1/4" hex shank with quick change for ease of use in impact drivers and quick change drill/drivers. Includes: 3/32", 7/64", 1/8", 9/64", and 5/32". High speed steel with M-35, five percent cobalt, for higher heat and abrasion resistance; heavy-duty web construction for strength and durability. Split point begins drilling immediately, minimizing bit walk when used in applications such as metal drilling, including heavy-duty abrasive alloy metal drilling on hardened steel (heat-treated). M7 grade steel with extra hard titanium coating and parabolic bit flutes for strength and maximum service in applications such as metal, wood and plastic; split point prevents walking. Tested design normally found only in industrial grade chucks. M-2 high speed steel for strength with black oxide coating for heat and wear resistance in wood, metal or plastic applications; split point ensures a true start and eliminates bit walking. Black oxide coated for greater wear resistance; split point drills on contact and prevents walking. Parabolic flute design improves chip ejection in metal and wood drilling applications. Helix is 31 degrees which minimizes the over aggressiveness of a true parabolic flute. Super hard coating reduces friction and heat build-up and 135 degree split point eliminates the need for a center punch and keeps the drill from skating on the hard materials. All sizes 3/16" and larger have 3 flats on the shank for a better chuck to drill bit grip. All sizes 13/32" and above have a 3/8" reduced shank. Includes (1) each: 1/6", 5/64", 3/32", 7/64", 1/8", 9/64", 5/32", 11/64", 3/16", 13/64", 7/32", 15/64", 1/4" and case with pilfer proof tab. High speed steel with M-35, five percent cobalt, for higher heat and abrasion resistance; heavy-duty web construction for strength and durability. Split point begins drilling immediately, minimizing bit walk when used in applications such as metal drilling, including heavy-duty abrasive alloy metal drilling on hardened steel (heat-treated). Titanium nitride coating and reinforced web for longer life added strength and durability. Turbomaxtip for burr-free holes; exact centering with walking on straight and curved surfaces; three flatted shank on 3/16" and above for better chuck grip. Titanium Nitride coating reduces friction and last longer, cutting edge stays sharper longer. Used in repetitive metal drilling with portable drills or stationary drill press. Jobber length. Bit is constructed of high speed steel for the best combination of strength, heat resistance, and wear resistance; 135-degree split point reduces feed pressure and allows for easier penetration without work hardening. Can be used with screw extractors. Carded. High speed steel with M-35, five percent cobalt, for higher heat and abrasion resistance; heavy-duty web construction for strength and durability. Split point begins drilling immediately, minimizing bit walk when used in applications such as metal drilling, including heavy-duty abrasive alloy metal drilling on hardened steel (heat-treated). M-2 high speed steel for strength with black oxide coating for heat and wear resistance in wood, metal or plastic applications; split point ensures a true start and eliminates bit walking. High speed steel with M-35, five percent cobalt, for higher heat and abrasion resistance; heavy-duty web construction for strength and durability. Split point begins drilling immediately, minimizing bit walk when used in applications such as metal drilling, including heavy-duty abrasive alloy metal drilling on hardened steel (heat-treated). Features a split point that starts on contact with no walking or skating, eliminating the need for a center punch. Bosch black oxide bits offer durability, speed and selection to support most general purpose applications. Speed helix design for faster drilling. Easier drilling and reduced heat for extended drill bit life. For use in steel, copper, aluminum, brass, oak, maple, MDG, pine, PVC, polycarbonate, acrylic, ABS, nylon and composite materials. Made of industrial grade steel with extra hard titanium coating for maximum service. Split point drill bits used in applications such as drilling in light gauge metals. Includes: 1/16", 5/64", (2) 3/32", 7/64", (2)1/8", 9/64", 5/32", 3/16", 7/32", 1/4" and case. Black oxide coated for greater wear resistance; split point drills on contact and prevents walking. Parabolic flute design improves chip ejection in metal and wood drilling applications. Helix is 31 degrees which minimizes the over aggressiveness of a true parabolic flute. High speed steel with M-35, five percent cobalt, for higher heat and abrasion resistance; heavy-duty web construction for strength and durability. Split point begins drilling immediately, minimizing bit walk when used in applications such as metal drilling, including heavy-duty abrasive alloy metal drilling on hardened steel (heat-treated). High speed steel with M-35, five percent cobalt, for higher heat and abrasion resistance; heavy-duty web construction for strength and durability. Split point begins drilling immediately, minimizing bit walk when used in applications such as metal drilling, including heavy-duty abrasive alloy metal drilling on hardened steel (heat-treated). M7 grade steel with extra hard titanium coating and parabolic bit flutes for strength and maximum service in applications such as metal, wood and plastic; split point prevents walking. High speed steel with M-35, five percent cobalt, for higher heat and abrasion resistance; heavy-duty web construction for strength and durability. Split point begins drilling immediately, minimizing bit walk when used in applications such as metal drilling, including heavy-duty abrasive alloy metal drilling on hardened steel (heat-treated). Tested design normally found only in industrial grade chucks. 5 piece set include: (2) 1/8", (1) 5/32", (1) 3/16" and (1) 1/4" drill bit. Titanium pilot point for longer life. Starts on contacts for cleaner holes. No spin shanks. Ideal for drilling in wood and plastic. Includes bit sizes: (2) 1/16", 5/64", 3/32, 7/64", (2) 1/8", 9/64", 1/2", 3/8", 5/18", 1/4", 3/16", 5/32", and a plastic tough case. Titanium coating for longer life. Speed tip reduces walking on start. Ideal use in commercial and residential applications for drilling in metal, wood and plastics. No spin shanks keeps the bit secure in the drill . Included tough case container to keep bits organized. Set includes bits sized from 1/16 to 1/2''. Made of shock resistant tool steel. Fits directly into the power drill chuck or Quick-Change chuck adapter. Provides a tight fit in the fastener recess in applications such as cabinetry, decking, drywall; 1/4" hex shank. Features a non-rusting, high-performance body with a unique sure-grip sleeve for maximum user comfort and hand tightening efficiency, reduces bit changeover time and boost productivity, never a key to misplace. High speed steel with M-35, five percent cobalt, for higher heat and abrasion resistance; heavy-duty web construction for strength and durability. Split point begins drilling immediately, minimizing bit walk when used in applications such as metal drilling, including heavy-duty abrasive alloy metal drilling on hardened steel (heat-treated). High speed steel with M-35, five percent cobalt, for higher heat and abrasion resistance; heavy-duty web construction for strength and durability. Split point begins drilling immediately, minimizing bit walk when used in applications such as metal drilling, including heavy-duty abrasive alloy metal drilling on hardened steel (heat-treated). Allows for round shank drill bits to be used in 1/4" hex quick-connect shank. Milwaukee Shockwave Impact Duty driver bits are engineered to be more durable and better fitting. The optimized ShockZone geometry is unique for each type to provide up to 30 times longer life and absorbs 3 times more torque. The Precise Fit custom machined tip prevents stripping and reduce wobble, while the Custom Alloy76 Steel and proprietary heat treat process maximizes resistance to wear and shock. Built to deliver extreme durability for the most demanding applications. Milwaukee Shockwave Impact Duty driver bits are engineered to be more durable and better fitting. The optimized ShockZone geometry is unique for each type to provide up to 30 times longer life and absorbs 3 times more torque. The Precise Fit custom machined tip prevents stripping and reduce wobble, while the Custom Alloy76 Steel and proprietary heat treat process maximizes resistance to wear and shock. Built to deliver extreme durability for the most demanding applications. Titanium coating for up to 3 times the life. Shockwave Impact duty, engineered for drills and impacts. Red Helix designed for rapid chip removal. Chip Breaker for decreased heat buildup. 135? split point for precision start and prevents walking for fast, accurate holes. 10 piece set includes: (2) 1/8" Titanium Shockwave, (1) 9/64" Titanium Shockwave, (1) 5/32" Titanium Shockwave, (1) 11/64" Titanium Shockwave, (1) 3/16" Titanium Shockwave, (1) 1/4" Titanium Shockwave, (1) 7/32" Titanium Shockwave, (1) 5/16" Titanium Shockwave and (1) 3/8" Titanium Shockwave. Also includes a case to carry the bits. High speed steel with M-35, five percent cobalt, for higher heat and abrasion resistance; heavy-duty web construction for strength and durability. Split point begins drilling immediately, minimizing bit walk when used in applications such as metal drilling, including heavy-duty abrasive alloy metal drilling on hardened steel (heat-treated). One piece construction. Premium high speed steel with black oxide finish. 1/4" quick-change shank. Set includes: 3/32", 7/64", 1/8", 9/64" and 5/32". Impact Duty Titanium drill bits with Red Helix are engineered for impacts and drills. Designed with a Variable Helix with an aggressive 35? Helix Angle that ends at 15?. Red Helix Design for rapid chip removal. 135? split point for precision start; no walking. Set Includes: (1) 1/16" Titanium Shockwave, (1) 5/64" Titanium Shockwave, (1) 3/32" Titanium Shockwave, (1) 7/64" Titanium Shockwave, (2) 1/8" Titanium Shockwave, (1) 9/64" Titanium Shockwave, (1) 5/32" Titanium Shockwave, (2) 3/16" Titanium Shockwave, (1) 7/32" Titanium Shockwave, (1) 1/4" Titanium Shockwave, (1) 5/16" Titanium Shockwave, (1) 3/8" Titanium Shockwave and (1) 1/2" Titanium Shockwave. Also includes a handy case to carry bits. Metal Impact Driver Keyless Chuck is a drill attachment that is made from metal. This chuck can convert an impact driver into a driver drill. It accepts round and hex shank bits. High quality steel with black oxide finish for corrosion resistance in applications such as automotive, MRO, portable drills, stationary drill press; 1/4" hex shank Jobber length with quick change for ease of use in impact drivers and quick change drill/drivers and 135 degree split point. Sizes include: 1/16", 5/64", 3/32", 7/64", (2) 1/8", 9/64", 5/32", 3/16", 7/32", 1/4" drills and Lock-N-Load Quick Change. High speed steel with M-35, five percent cobalt, for higher heat and abrasion resistance; heavy-duty web construction for strength and durability. Split point begins drilling immediately, minimizing bit walk when used in applications such as metal drilling, including heavy-duty abrasive alloy metal drilling on hardened steel (heat-treated). High speed steel with M-35, five percent cobalt, for higher heat and abrasion resistance; heavy-duty web construction for strength and durability. Split point begins drilling immediately, minimizing bit walk when used in applications such as metal drilling, including heavy-duty abrasive alloy metal drilling on hardened steel (heat-treated). Ground from solid 1 piece design and is up to 5 times more durable. Web taper increases the rigidity of the bit to decrease the potential for bit breakage. Pilot point tip allows users to drill holes faster and offers clean burr-free holes. Common users include electricians, HVAC, mechanic, glaziers and General contractors. Designed for metal or wood. 1/4" hex shank. Set includes: (2) 1/8" bits, (1) 5/32" bit, (1) 3/16" bit, (1) 7/32" bit, (1) 1/4" bit and (1) 5/16" bit. High speed steel with M-35, five percent cobalt, for higher heat and abrasion resistance; heavy-duty web construction for strength and durability. Split point begins drilling immediately, minimizing bit walk when used in applications such as metal drilling, including heavy-duty abrasive alloy metal drilling on hardened steel (heat-treated). Thunderbolt web, provides longer life and faster driller times. Parabolic flute, clears chips faster. 135 degree split point, precision start no walking. Titanium coating keeps the bits sharp. 14 piece Thunderbolt Titanium Coated drill bit set contains: (1) 1/16", (1) 5/64", (1) 3/32", (1) 7/64", (2) 1/8", (1) 9/64", (1) 5/32", (1) 3/16", (1) 7/32", (1) 1/4", (1) 5/16", (1) 3/8" and (1) 1/2". High speed steel with M-35, five percent cobalt, for higher heat and abrasion resistance; heavy-duty web construction for strength and durability. Split point begins drilling immediately, minimizing bit walk when used in applications such as metal drilling, including heavy-duty abrasive alloy metal drilling on hardened steel (heat-treated). Impact ready shock absorber can be used with both rotary and impact tools. Magnetic steel heel secures bit in holder. Includes 1 each: 1/16?, 5/64?, 3/32?, 7/64?, 1/8?, 9/64?, 5/32?, 11/64?, 3/16?, 13/64?, 7/32?, 15/64", all 1/4" hex shanks, and all ?? hex magnetic bit holder. 9" Overall length. Single sleeve design allows for single handed tightening. Built with all-metal construction for maximum durability; 1/4" hex quick connect allows users to change from fastening to drilling.